By John King, Cordax Evaluation Technologies - Journal of Petroleum Technology - November 2018. All images courtesy of Cordax Evaluation Technologies. Logging measurements are recorded to memory while drillpipe is tripped to surface. With drilling on the rise, US oil production is expected to continue to increase. However, many industry professionals are concerned that the “brute force” model, which has seen a massive influx of capital flow into completion and hydraulic fracturing operations, is not an economically sustainable business model. There is a growing belief that better understanding of the effectiveness of completion designs and hydraulic fracturing strategies will require far greater subsurface geological understanding. Moreover, continued well productivity improvements will only be realized through improved reservoir characterization, and by applying formation petrophysical and geomechanical information to optimize methods of drilling, completing, and stimulating wells. There has been considerable media attention focused on how the industry is drilling wells longer and more quickly, as well as applying higher-intensity fractures. Until recently, however, there has been less emphasis on constructing productive wells with less capital. Traditional vertical well tool conveyance methods effectively addressed industry logging requirements for almost a century, but in today’s “horizontal” world, conventional methodologies are either not applicable or expensive and risky. Essentially, the multibillion-dollar logging market has not quite been turned upside down, but has toppled onto its side. Using available industry data, the low-hanging fruit in the growing “big data” boom, geosciences departments have labored to build accurate high-resolution geological models. Given the nonhomogeneous nature of the geology in unconventional reservoirs, applying vertical offset well logs and interpolating field reservoir models is generally accepted as a good start, but hardly the complete solution. To develop an accurate reservoir model, the heterogeneous nature of shale plays requires far greater data resolution than most operators appreciate. If operators are going to efficiently exploit every stage of their wellbore, they need accurate, measured formation insights along every foot of the horizontal wellbore. Geometric completions and fracturing strategies are not practical or effective in these unpredictable heterogenous environments. Along the wellbore, operators are encountering highly variable rock properties that affect fracturing efficiencies, and result in poor or unexpected well production results. This trend is forcing producers to evaluate stage-by-stage production contributions. They are finding that large portions of their wells are not contributing. There is a growing realization that improved well results that are repeatable and predictable are only going to come about by enhancing production at every stage in the wellbore. This requires engineered completions programs and tailored fracturing strategies that account for the considerable rock heterogeneity along the lateral. Operators are not simply seeking openhole logs. They want to translate formation evaluation measurements into useful insights that enable them to adjust their fracturing and completions strategies. They are looking for ways to incorporate subsurface geological data into practical operational applications that improve fracturing efficiencies and maximize well productivity. The company provides a range of interpretive ¬desktop-based engineering software tools. The traditional LAS [Log ASCII Standard] format is still provided, but various interpretive solutions offer critical insights into how best to adjust fracturing operations or tailor completions programs. This is made possible by a combination of the following tools: the ZoneGrader tool enables operators to grade a well based on their own predetermined petrophysical or rock parameters and make informed decisions that address the lack of homogeneity in horizontal laterals; the ZoneTuner software incorporates geomechanical properties and limited entry calculations along the horizontal lateral to automate stage placement and sizing, while optimizing cluster locations to minimize interstage formation closure stress differences. This results in more efficient fracturing operations, optimizes the stimulated rock volume, and increases the production potential per stage; and the Zone-Predictor provides a clear appreciation of formation breakdown pressures, reservoir ductility or brittleness, as well as geologic anomalies. This enables operators to minimize expensive unscheduled events and ensure proppant loading is maximized. Various related well data sets—such as cuttings analyses, gas detection, tracer surveys, and actual pumping records—are also overlaid to provide a full view of why actual well productivity may be different from the anticipated. This way, a continuous improvement process can be implemented. It helps to connect the data to the well production in order to understand the relationship between the completion, the stimulation treatment, and ultimate well productivity. The software optimizes stage positioning and sizing while engineering perforation cluster locations. The logging toolstring is pumped down the drillpipe after the well has reached total depth. An extra trip is not required. In addition, because the tools collect data in memory, wireline is not required at any stage of conveyance or logging operations. When the tools reach the landing assembly located above the measurement-while-drilling and mud motors, a pressure spike is recorded on surface indicating the tools are secured within the proprietary drilling collars. Openhole logs are collected as the drillstring is tripped to surface. Drillers can circulate, rotate, or conduct reaming operations while sliding pipe in either direction. Being inside the drillpipe and fully retrievable, the risk of losing expensive tools and their radioactive sources is virtually impossible. Utilizing logging while tripping (LWT), the actual formation properties are measured and calculated, rather than derived or inferred from drilling parameters or other data sets. The quality of the LWT log has been subjected to intense scrutiny. Measurement accuracy has been validated against wireline and LWD data sets in vertical and horizontal wells by independent operators and supermajors in North America, and several foreign national oil companies. Today, LWT generates conventional and spectral gamma, compensated neutron, formation density, and resistivity logs. Resistivity logs are supplied in the form of induction, propagation, or laterolog measurements. Operators in the US, particularly in the Permian and Oklahoma regions, are employing LWT, and demand is rising in new markets, including Latin America and the Middle East. There is no typical well profile because LWT is equally efficient and effective in deviated, vertical, and horizontal well applications. Recently, a 6,750-ft horizontal lateral section of a 17,500-ft measured depth well was logged. During a bit trip conducted earlier in the well program, the operator had inserted Cordax steel collars in the bottomhole assembly and drilled approximately 9,000 ft to total depth. The operator then circulated bottoms-up, rigged-up the LWT tools on the rig floor and pumped them down the drillpipe where they were eventually secured in the landing sub. The entire tool deployment exercise took approximately one hour. The customer then tripped pipe to surface, and took measurements with the tools situated securely inside the steel drilling collars. To ensure data quality, typical tripping speeds within the designated well section are marginally slower than normally employed by drillers. Otherwise, tripping to surface following logging is conducted at normal speeds. Keeping rig time to conduct LWT services to an absolute minimum is critical. After the LWT assembly was tripped back to surface, it took 25 minutes to rig down the tools. The full suite of logs was provided 3 hours later. The additional rig time required to run the LWT service totaled less than 5 hours. An operator in Texas that employed “plug and perf” completion practices continually experienced stimulation challenges in approximately 30% of well stages. The operator regularly struggled with formation breakdown and subsequent proppant loading. LWT logged 7,118 ft of interval in a 16,713-ft measured depth well. Using ZoneGrader engineering tools, the operator evaluated petrophysical and geomechanical properties along the lateral and customized stage architecture, while ZonePredictor predicted accurate formation breakdown pressures at every stage. 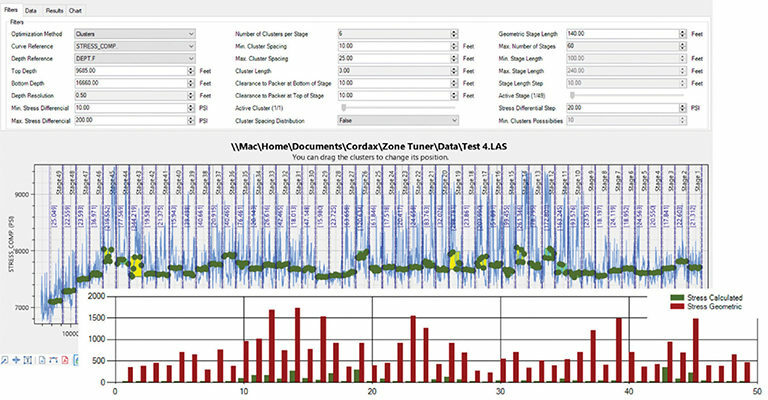 Using ZoneTuner software, the operator custom-engineered perforation cluster placement and optimized fracturing efficiencies. All but one of the stages were successfully stimulated. While “brute force” exploitation methodologies have demonstrated increased well productivity, they have also typically resulted in considerably more spending, and stimulated much debate about whether ultimate recoveries have actually been improved. Increased scrutiny from capital markets and shareholders is shining a spotlight on industry profitability, as suggested by the Wall Street Journal in “Shale Produces Oil, Why Not Cash?” (28 June 2017). Today, some form of art that features a combination of longer wells, more stages, different completion techniques, various sizes and quality of proppant, numerous treatment fluids, and a sampling of broad and relatively low--resolution field geology is being applied to optimize well productivity. Although repeatable and predictable results have been elusive, some well productivity success has been demonstrated. However, with so many variables to the recipe, most observers agree that exploiting shale is more of an art than a science. Formation logging data is the science that will help pull all of these operational variables and disparate data sets together. John King, Cordax Evaluation Technologies.